Hello: I completed my initial Facilitator training with Francesca Boring in 2009 and 2010. What an experience! I now offer my particular technique to the world. I often and most usually use the techniques of Constellations into my treatments and especially in combination with GNM or dowsing work. I will also do a Constellation Workshop if it somehow manages to manifest that at least five people want to get together and experience. Payment for these will be by donation. People generally believe that: Their events or reactions to events in life are common to many people but the real problem is in the belief that they are caused by outer events or the behaviors of other people. The tragedy is in thinking we have no ability to change these states of mind. That is the key right there; they are states of mind, not permanent fixtures in our life. They are reactions to experience based on erroneous assumptions about how we become sad or depressed or fearful or resentful. It is not what happens in our lives that shape our perception; it is our perception of self that shapes our reactions. Put five people in the same experience and there will be a few who agree on the correct way to feel about it, but there will also be one or two who have a vastly different response. These folks have a whole other way of seeing themselves in the midst of the experience. “”” Fran, somehow, someway, I am going to find a way to put the Power of the above constellation into my teachings. I want to incorporate the ‘toughness’ of the Truth into my facilitation of constellations. I want people to know they are coming to me I am the facilitator who will facilitate them to ‘rock-their-boat’. I’m going to tell them – You asked for change – hang on you are going to get it – hear it – experience the possibility of it! You made the choice to be here, because you wanted to facilitate Change! When it begins don’t stop the process because you want to control the intensity of the awareness of the change. Life is LIFE and it isn’t all gentle, sweet and easy goes! When you come to me for constellations – expect Change! If you ask – expect results! Don’t put on the brakes when the going gets tough! Keep going! Accept and experience your personal Power! My Ancestors experienced LIFE and most of them came in to the finish line with tons of bruises, many nicks and scratches, a half-smile on their face most declaring that was one hell of a ride, and admitting they had screwed up in a few of the experiences and agreeing to the Need to do it again only this time better! I am hoping to assist people to make that journey with as much bravado and Love in as POWERFUL and Self-Empowering a manner as possible. I Declare: I am in this Lifetime having another go-around and what a Delight it has been so far! I love my life! I forgive myself! I am sorry, please forgive me, I Love You, thank you ……. Dr. Bert Hellinger, a German Psychotherapist, originally developed Constellation Therapy. Many others have now expanded on his technique to bring in a more spiritual approach. If you’ve ever experienced “peeling the onion layers” with regards to healing even physical issues on this level, imagine what can happen when those layers involve spirit, past lives, ancestors, other higher levels of existence, etc.Someone requesting a Constellation is asked to describe what they’d like to achieve in one concise sentence – if this can’t be done, then they aren’t quite ready to clear the issue. Once the sentence is put out to the group, the person then starts to pick surrogates. The facilitator organizes the Constellation and help with deciding what parts need to be played, as well as, how the interactions and process moves along. Surrogates represent the person and others (people or things – illness, disease, money, blocks, divine guides, etc.) that are involved in the issue. The person then intuitively places the surrogates, one by one, in the room (forming a constellation). The surrogates take a moment to tune into their roles. The facilitator has set the energy and called in all the Divine Guides for protection, guidance and clarity for the highest good of all. The issue is worked out to a state of resolution. Sometimes, it is cleared and other times the info brought forth is so complicated or involved that it will require a separate future constellation to clear another part or layer.After the constellation is complete and energies cleared, a time frame is given, by the facilitator, when the constellation is not to be discussed by anyone (generally 2-7 weeks), in order to allow the shift to take place. Dreams and journeys can be recorded during that time but no discussions! Constellations work on people that are not present, don’t believe and have no idea that anything has been done – especially good in old family dynamics or patterns we may carry from childhood. Suddenly, that relative will start acting differently (a shift has occurred!). When you decide to participate in a Family systems constellation process you need to be aware that your family system may be bigger than you are aware of. In constellation work, family system is viewed to be seven generations back and seven generations forward thus teaching was relayed to be conscientious about life choices that would have impact in both directions. All children including those who may have died early, in various ways during birth, before what is considered viable by the medical system such as miscarriage, or abortions. Brothers and sisters be they still living or have died. The parents and all their siblings including those that may have died early. Ancestors who are further back than you can remember on either side of the family. Anyone within the family system who may have made room to the advantage of someone else within the system, this could also include former partners of parents, grandparents as well as anyone who’s misfortune or death brought the family an advantage or gain. Sometimes people who have saved the life of a family member. In preparing for a family constellation your question or concern should be of a serious nature to you, not merely curiosity. Ask yourself if there is one thing I want to change about the situation what would that be? Do I want to change the situation? Once you start the process there will be change and you need to be aware that it may not be what you envision it to be. Changes will occur, as the soul allows for the good of all involved. By phrasing your questions in the context of yourself you are taking ownership of your experience and process thus it will be of more benefit to you specifically as well as touching others in your family system in a beneficial way. Fran is a graduate of Washington State University and studied with D-Q University, Davis, California, which was staffed by academics and traditional Elders from the Americas. 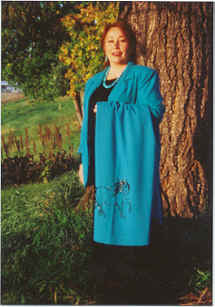 Author of FEATHER MEDICINE, Walking in Shoshone Dreamtime: A Family System Constellation, 2004 and Coyote Dance, 2005 (Llumina Press), on the advisory board for and a contributing writer for the Systemic Solutions Bulletin, London, England, Francesca was also included as guest author in Unten Rum, by Claudia Haarman of Germany. Currently, Francesca’s book: Notes from the Indigenous Field: Constellation, Ceremony & Ritual is being translated into German for publication by Carl-Auer Verlag. Fran has facilitated, lectured on &/or taught Family Systems Constellation in Germany, Switzerland, Holland, Singapore, Australia, Canada & throughout the Western U.S.
Francesca has been included on the faculty for the Constellation Intensive on systemic Resolutions in Southern Germany since 2007.